Ever since I saw that yellow DownEast Basics necklace on your website, I've been trying to find one like it but to no avail. 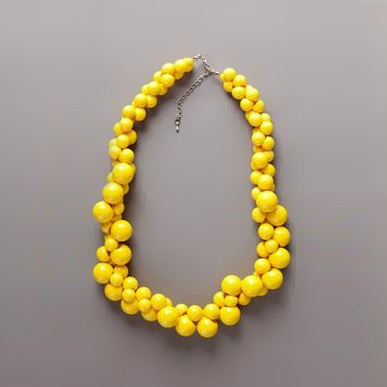 I'm dying to have some yellow accessories and was hoping you could help me find one as darling as the DownEast Basics one! Thank you! See? Do you want it? Well, you can't have it. It sold out - quickly. I did come across a pretty good substitution, and guess what? It's on sale.You're welcome. The first necklace, absolutely! The second one, no. I feel like I'd be constantly trying to make it "hang" right. I'd get frustrated because I'm too neurotic. I love the first one. The second one is "ok" Lovely blog. The 2nd one does not feel right. But why don't you just make your own version of the first one? I guess it would be 3 strings, beads in 2-3 different sizes and somehow skeewed and interlooped. I'm one of the lucky ones that owns the above DownEast basics necklace. It's tad on the bold/heavy side, but I totally love it! If I hadn't snagged the DownEast one I totally would jump for the Charlotte Russe one! It looks so dainty & feminine while still having the pop of bold yellow. Great find, Madeline! !